Looking for that perfect treat to compliment the colour scheme of your home, office or special event? Look no further than our amazing fortune cookies. With eight custom colours to choose from, you are bound to find the perfect treat to suit your needs. 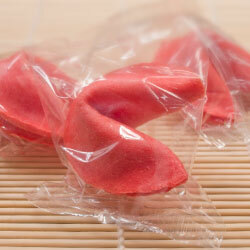 Our custom coloured fortune cookies come with a personalized message. Cookies with Style!! !